If you know about PHP function scenario, you can quickly understand this procedure logic. Because both the concept looks like same. Only thing is stored procedure concept will use Direct to the database. Once you created procedure it will be stored in your database. You can call it any number of time. Every procedure has some unique name. Based on that name call your procedure function. It can reduce the network traffic time - Load a large number of record in your database it took much time to load on network traffic, By using the procedure it will take less time to execute the query. Modular Programming - you can modify stored procedures independently of the program source code. Reuseable - Same procedure you can multiple time with a custom parameter. The Following syntax creates the stored procedure. To test stored procedure execute below statement into the MySQL command interpreter. The procedure statement will execute command line interpreter. Most of them have PHPMyAdmin try to execute procedure statement with PHPMyAdmin SQL compiler. Before the start, this tutorial Create a new table or if you have existing table use procedure code. later Create a new stored procedure named GetUSersinformation(). The GetUSersinformation() retrieves the all users name list. DELIMITER - Pass the entire stored program definition to the server. BEGIN, END - Procedure code start and end. However retrieving SQL statement. Follow the same way to get procedure CALL(); Follow the below PHP script to retrieve the stored procedure SQL information. 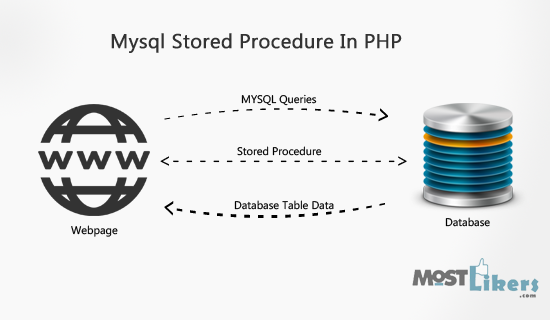 In this tutorial, you have learned how to call MySQL stored procedures using PHP. The upcoming tutorial will guide you with a parameter way get procedure data.